Slip stitch into the 3rd stitch from the hook and then *Hdc in the next stitch, slip stitch into the next stitch*. Repeat between * across the row. Chain 2, turn. Skip first stitch and slip stitch into the next stitch. *Hdc in next stitch and then slip stitch into the next stitch. * Repeat between * across the row. End each row with a slip stitch into the very end stitch of row to square up the edge. Repeat row 2 until you reach desired length of blanket. Tip: Make sure you work a slip stitch into the Hdc of the prior row and Hdc in the slip stitch of the prior row as you work the pattern across each row. I worked 50 rows in the moss stitch before crocheting the border for my preemie blanket. Starting in a corner, chain 1 and Sc evenly around each side, working 3 Sc in each corner space. Join with a slip stitch into the beginning chain 1. Chain 1, *Sc in next stitch, skip 2 stitches, and work 6 Dc in next stitch, skip next 2 stitches*. Repeat between * around blanket and join with a slip stitch into the beginning chain 1. Finish off. 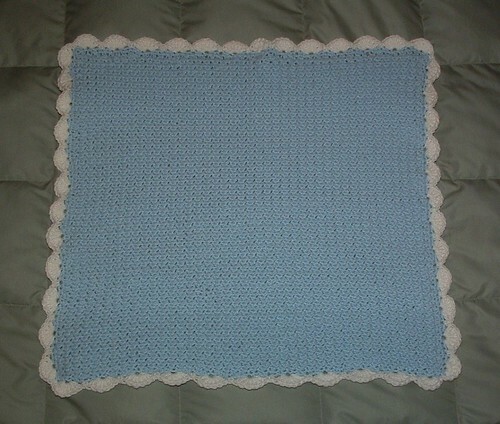 Baby blanket is 22 inches wide by 22 inches long.